A guide to early Kawasaki fuel injection as used in the 1980 z1000G and H models. This information has been derived from personal investigation of my own z1000g motorcycle and the assistance of the worldwide “Z” owners community. In 1980 Kawasaki took a departure from conventional motorcycle design and release two EFI based models, the z1000H and the z1000G. The z1000H was only released in 1980 and was sold in Europe, Australia, New Zealand and Africa (and maybe one or two other places). It was not released into the United States but some machines did find there way there. It came in Black with gold pin strips and the alloy wheels where gold with a polished rims. The bike is essentially a z1000 MkII motor with a different cylinder head featuring port injection. The throttle bodies only contained a butterfly valve and the choke mechanism. The reliability of the Digital Fuel Injection (DFI) system was questionable and many bikes found themselves being converted to carburetors very quickly. The success was short lived as neither model saw a second year. 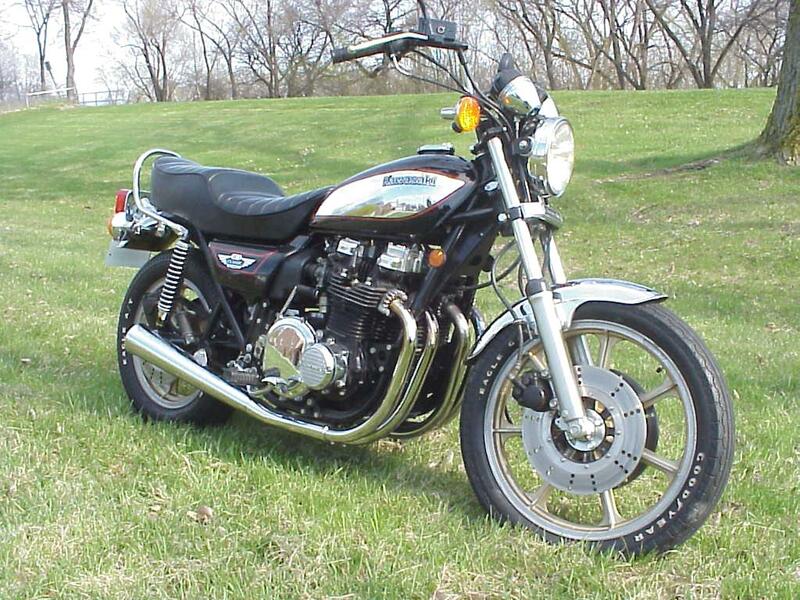 The 1980 z1000G was also referred to as the “z1 Classic” as this is what is stamped on the side covers. It Is an “Custom” style z1000 MkII with z1/z1a/z1b style side covers in a similar vein to the LTD’s that came before it but generally acknowledged as not as good. Cosmetically it had a very large seat, chrome grab rail, round tank (with chrome fitted plates) and pull back handle bars in the “custom” style of the era. The “G” model was released in the USA only. Some have found there way to Australia and Europe. The “G” and “H” models are among the rarest of the Kawasaki line up and make an excellent bike if the EFI hardware is maintained or replaced by an aftermarket MegaSquirt System. The “G” is an ideal rebuild project, while you could restore it back to factory specifications if you wish to seek the unusual style of the era, but it would be cooler to rebuilt it back in the style of a Z1. The “H” makes both an excellent factory restoration project but has plenty of scope to be rebuilt as a more modern bike. The EFI/DFI (Electronic Fuel injection / Digital Fuel injection) was adapted from an automotive system developed by either Datsun, Nissan or Bosch (no one can give a definitive answer) and was re-badged as “JECS”. The Injectors are low impedance and pull a large current to snap open at high RPM. Today, high impedance injectors are available that have the same or better characteristics. The controller is obsolete and not user programmable. Almost any aftermarket system can be used to replace it, the Mega-Squirt (MS) would give the best bang for the buck and is fully programmable as well as a working track record on z650, z900’s and z1000’s. Before considering conversion it is important to understand the design of the EFI in factory form. The original design uses an air flap to measure the air flow. This is clearly from a car design and is not suitable for a motorcycle due to the large overlap of the cams and the pressure wave issues inside the inlet ports. Possibly not know at the time by the engineers. In addition to the Air Flap, the EFI system has 3 additional sensors. A sensor to measure the cylinder head temperature also known as Coolant Temperature (CLT), an Inlet Air Temperature sensor (IAT) and a Throttle Position Sensor (TPS). The TPS is not a variable resistor design as used in modern systems, it is basically a switch for idle, off idle and Wide Open Throttle. This was changed in the B2 model to a variable TPS. Key feature here (apart from RUST!) is the port injected head where the injectors are mounted directly into the head. Later models use Throttle Body Injectors (TBI). The injectors are mounted onto the head (Port Injection) and fuel is delivered to the injectors via a common fuel rail that is under pressure from an electric fuel pump. The pressure is controlled via a vacuum control valve which derives its vacuum from the 2 and 3 inlet manifold rubbers. The fuel is returned to the petrol tank via a one way valve in the base of the tank opposite the tap. The fuel pump is controlled via a relay which is controlled via the EFI computer. The computer also measures the ignition pulse rate from the coil to determine engine RPM. The system is quite simple but has no scope for user configuration hence it cannot be altered for different fuels and engine modifications. The EFI computer also has no O2 sensor support capability so self tuning and monitoring of O2 emissions is not possible. The VE calculations for the engine must be precise in order for it to work correctly. This system was used on 1980 z1000G, 1980 z1000H and the 1981 GPz1100B1 models only. The 1982 GPz1100B2 uses a totally different system (much better and in line with modern systems but still very limited). The sensors could be used if you recalibrate the CPU to recognize the response curve of the sensor or just replace them with GM parts to gain both reliability and the default code is compiled to support them. The TPS design has basically not changed from the B2 model, but the G, H and B1 TPS is useless with anything else but the factory EFI. If you plan to modify the system to use a later model then I would be replacing the TPS with a modern unit and replace the connectors at the same time just to improve the reliability. Ditch the air flap, put it in a display case and use an automotive GM MAP sensor. The Mega Squirt (MS I) unit has a MAP sensor on board. The Micro Squirt (released in 2007) requires an external one. A GM MAP sensor from any modern car will do the job, just double check the pinouts and specs to be sure. You will need a restriction valve to dampen the air turbulence inside the inlet track. Use the same mounting point but allow for the ability to plug in a computer so you can do all kinds of neat things like data logging and tuning. The connector on the factory unit cannot be used, so you will need to remove t, see “Wiring” below. The standard injectors are low impedance (<2 ohms) so a flyback board is required, they are Bosch injectors made or sold under license at the time. You will not be able to buy originals so just use a modern equivalent. The exact flow rates are not documented but some calculations using an online calculator should yield the correct result. You might be looking at a 200cc/min injector. The pressure regulator wont change as the standard pressure is somewhere around 36-42 psi. You will need to change little of the wiring just connect it to the correct points on the new controller. The air flow wiring can be ignored unless an external MAP sensor is being used on a Micro Squirt. Double check the injector wiring, you may need to run an extra one to do bank firing as it may be a single fire (I cant remember but will check). Updated 2014-08-12 – Spelling and missing TPS information. I have 3 h models. ..One I ride and the other 2 I am turning into a factory restore. The original efi works great on 2 out of 3..
Hi Scott,I’ll try to help:)The cool thing is that all the injectors are the same on all fuel injection models so they stay as they are.You need the wiring loom for the fuel injection,the computer, mixture sensor and the airbox temperature sensor from the B2.Incidentally you can use an 1100UT computer on a B2(so here also) and in my opinion they seem to run smoother. The tricky part is that on the b2 the mixture sensor is mounted on the right side of the throttle assembly,on the classic(and 1100 B1)the switch is on the left side.So I carefully drilled through the sensor,then filed carefully enough plastic away that I could mount the mixture sensor ‘backwards’ on the throttle assembly. Once that is done it’s just a case of making all the electrical connections fit,I’ll have to look again and take some pics.Can I post pics here or maybe I can mail some. I wanted to put the complete airbox from the B2 in but the frame on the classic is narrower and it would fit .That means the air measuring device is still in but not connected anymore.The B2 electrical connections are much simpler. I drilled a hole in the main part of the airbox for the temperature sensor for the airbox. I didn’t change the temperature sensor in the cylinder head but I might yet as there is a different part number from kawasaki. The tank has a 1 way valve so it should not cause any issues, that leaves the pressure regulator on the fuel rail, its vacuum powered so it should be easy to check, does the pump prime when you turn the ignition back on? Perhaps the issue is the pump or pump relay? Hi there. I don’t do much of this but I have a 1980 kz1000 with fuel injection. It’s been sitting since the early 1990’s. The entire fuel system has essentially been rebuilt and it starts and even runs fairly well but after a few minutes it just dies and then doesn’t really want to restart for a bit. We’ve spent a lot of time fooling with the two pressure regulators (the one in the tank and the other one that is basically a fuel pump) but it always acts like its either starved for fuel or flooding itself out??? Any ideas? Yes I think we’ve narrowed it down to the pump. I had only two technical problems. Both not found in the manual. The engine temp sensor tested okay…in theory but not in practice. I measured the resistance from the micro processor to the temp sensor. That was fine in theory but not practice. I opened up the wiring harness and found an inline resistor. I simply crimped it to improve the connection. This RESOVED THE PROBLEM. 2nd issue… the fuel pump primes when you turn the ignition on. It failed to do so one day. I opened up the air flow meter and found a set of contact points. Cleaned the contacts with a points file. That fixed that problem. No other problems ever! The main problem on the system was usually the air flow meter,either the unit or the connections.One of the reasons I converted my G1 to the later system is it’s more reliable…. You can actually disconnect the airflow unit and the DFI keeps working… connections are always an issue as are dry joints… just check everything, it does work but its not very good compared to later systems. Hi , I have been been enjoying the input very much. I have a Z1000 g classic ( imported from Spain to Australia)iI am trying to get it on the road. All paperwork in order.It already has been converted to carbs from previous owner. Needs a fair list of things to be finished ( mainly newwiring and a newseat and seals) the bikes seems to run well with injection ports all blocked off neatly. Can anyone please tell me if I have another issues to consider re . Heads , pistons , compression to worry about with efi to carbs set up?